An excellent machine for all rental fleets. A height of 2.47 m and a bucket width of 1.6 m make this machine ideal for narrow work sites. A highlight of the machine is the temperature-dependent hydraulic fan control. This system offers minimum noise emission and low fuel consumption. 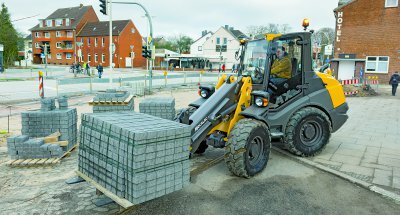 The new Mecalac AX series convinces with robustness, low running costs, ease of operation, simplified maintenance and, last but not least, a sleeky design.